First of all, iranbaan on Twitter is reporting that Yazdi has said that Mousavi will not be able to contest upcoming elections (if you're not sure who Yazdi is, he's the member of the Assembly of Experts that thinks "It doesn't matter what the people think. The people are ignorant sheep"). In a way I'm a bit glad to see this, since it was already quite obvious that Mousavi wasn't going to be approved in the next election and this is a nice reminder that there simply isn't going to be any semblance of fairness in upcoming elections as well. Foreign Policy in Focus has an article today on foreign-backed coups or revolutions vs. those that happen on their own accord, and is of interest to those that want some background in order to contrast events now (not backed by foreign forces) with 1953. Quick note on the Bon Jovi / Andy Stand By Me video: I'll be posting it here tomorrow with the lyrics in Persian in the first part for those studying the language (spent a few hours on the other video today and don't feel up to it at the moment). Hillary Clinton chose the right tone IMO when referring to the election, declining to comment (in detail) but still mentioning their "credibility gap" with their people and mentioning the lack of credibility of the vote recount. On the vote recount: kind of similar to the Yazdi statement above. We knew the result was going to be "yep, nothing's wrong at all, election was awesome" so in a way it was good for them to handle it so bluntly. I'm still a bit mystified that the government is adopting this tone - they are being extremely blunt and not giving anyone any hope for a democratic solution, but the crackdown still isn't of the ferocity usually required to completely silence dissent. It's tough enough to keep protests from blooming, but it's still only tough enough to drive people back a single step while they wait for the next opportunity. I really don't get how they think they are going to manage the next four years with this approach. Then again, with this much attention being paid to their every action they probably just aren't able to silence dissent entirely as they might have wanted to otherwise. The Washington Post today notes that some people in Iran are simply thinking of leaving the country as a result of this election as the status quo shows no hope whatsoever for any improvement. Nice quote from an article here: "Mixing religion in the affairs of the state distracts from religion and from the state". The part on the left is -nejad, and the right says Ahmadi-. 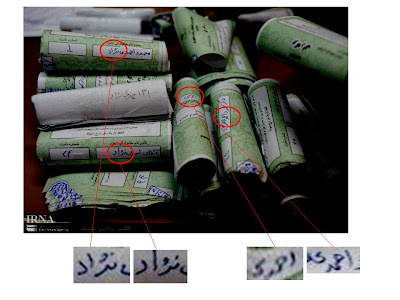 Rezaei's unofficial spokesman has also apparently said that a lot of the ballots were written with the same pen in the same style.